Many bonsai can be classified in this category and this is the most popular style of tree both in bonsai and in nature, with the possibilities for design being endless. The trunk is not straight and may contain several curves, with branches usually emerging from the outside of these curves. This is a suitable style for all varieties of trees and shrub and is perhaps the least difficult style to create. The apex will in most cases be directly above and in line with the base of the tree and for best effect be slightly angled forward to give the tree added depth. 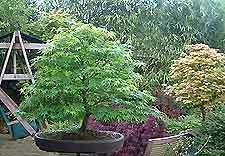 It is also a style where most shapes and colours of pot can be used, depending on the variety and size of the tree. 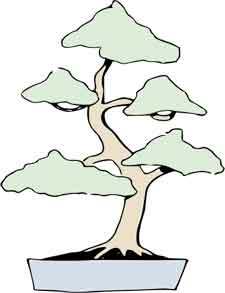 Informal upright is a popular style of bonsai tree, which is also very wide spread in nature, with many differing branch structures.